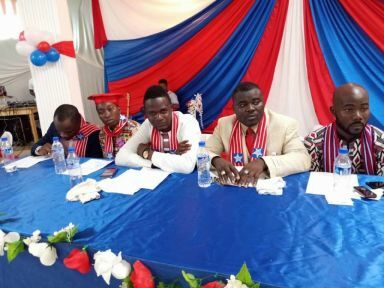 Liberia’s Finance and Development Planning Minister Samuel Tweah has put out a challenge to members of the newly inducted Liberia National Student Union (LINSU) leadership to remain focused and speak to power. Minister Tweah made the assertion Friday, November 10, 2018, during the fourth post-war induction ceremony of the Liberia National Student union (LINSU) at the Executive Pavilion on Broad Street. LINSU inducted its corps of new officials to run the affairs of the Liberian student community for the next two years. Minister Tweah wants the LINSU’s leadership to speak against what he calls “bad politicking” in society; something he believes, has the propensity to destroy the country’s students populace. The Keynote speaker at the same times called on the leadership to become a national force for galvanizing and mobilizing patriotic young Liberians that will transform Liberia and to be successful. He pointed out the by being matured and transformed into a productive student organization with meaningful and powerful contributions toward national development is praiseworthy. “This new LINSU should not do the political bidding of any governing party or political administration. The new LINSU should not just make its national contribution through press releases or political protests. “The new leadership should distinguish itself through action. The whole construction of a new Liberian future rests with students and young people. It is their behavior and their values,” he asserted. Minister Tweah also calls on the newly inducted executives of the Liberia National Student Union not to be influenced by politicians. He challenged the Mohamed Kamara-led administration of the Liberia National Student Union to be great leaders and strive to inspire other students. Also, LINSU President Mphammed Kamara said the student grouping will ensure that Liberian students get better education through the decentralization of the Union. He announced that LINSU will organize national intellectual fora aimed at building the capacity of students. According to Kamara, his leadership will seek to promote a scholastic environment affordable for the necessary standards of quality to meet the development of the full potential of all students in meeting the technical and professional labor demands of the society in this 21st century. “This victory, this honor, this leadership, finally, belongs to the students of Liberia. Our courage to serve was drawn from your cause for social justice and academic freedom,” Kamara said. Prior to the new LINSU’s head ascendancy, he was serving as the Assistant Secretary General of the Student Unification Party at the state-run University of Liberia. Kamara now succeeds Varney Alieu Jersey, the immediate past president of LINSU. LINSU was founded by in 1952 and enacted into law by an act of the Legislature on January 20, 1957. Its mandates chiefly include serving as the biggest student-based advocacy institution responsible to coordinate activities of all students in Liberia and seeking legal redress when their rights are trampled on. Can Dr. Dennis Maintain the Peace at UL?